Against her better judgment, Chris Gitelson follows her childhood friend, Aileen Sesso, onto the glass floor of the Glacier Skywalk and sits down. 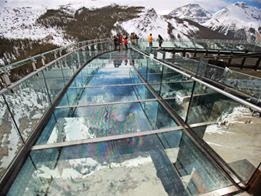 They’re 280 metres above the Sunwapta Valley, a canyon with the Sunwapta River running through it, on opening day for the skywalk, a controversial development in Jasper National Park. Ms. Gitelson isn’t so sure. Ms. Sesso, who has been friends with Ms. Gitelson since they were Grade 1 classmates in Brooklyn, N.Y., laughs. “You don’t even want to know the things I made her do when we were kids,” said Ms. Sesso, as the pair embarks on their latest adventure in the Canadian Rockies with their husbands.